Located near two major rivers in Japan called Arakawa and Tone River, Kumagaya-city is blessed with clean underground water. The extensive plain, the premium amount of sunshine and the greenhouse hot summer weather in this area combines to grow rich crops to make Sake. The severe coldness of winter in Kumagaya-city is also a key to foster rich and refreshing Sake quality. “Sake Musashi” is the type of rice uniquely developed in Saitama prefecture specifically to brew Sake and is produced mainly in the Kumagaya-city area. The prefectural research institutions located in Kumagaya-city are developing various yeasts to enhance the quality of the Sake that is produced. We use excellent local ingredients to make regional boutique Sake. We use a time honored traditional method to brew our Sake at Gonda Shuzo called Funagake. Funagake is used to extract Sake and then kept chilled or frozen, depending on the nature of the Sake. After the Sake has aged and fully developed flavor and taste, it is ready to be distributed. Since the Kaei era of late Edo period in 1850, we founded in this area and have been a part of brewing business for about 160 years. We intend to make a local boutique Sake that brings pride to the people of Kumagaya-city, by refining the rich tradition we have inherited. Kumagai no Jiro Naozane is a famous local historic figure who served as a commander and Buddhist monk from the Heian to Kamakura era. While he was praised as the strongest in Japan by Shogun Yoritomo, he was also known as a humane warrior because of the mercy he demonstrated with a young warrior named Taira no Atsumori during the battle of Ichi-no-Tani. This epic historical battle lives still in its retelling in Kabuki theatre and numerous war chronicles. Later in life, Naozane became a Buddhist monk under a new name, Horikibo Rensei, and was a devout follower of Honen. He eventually was referred to as Buddha Amida of Bando and a saint shonin for his action ad sincere faith. 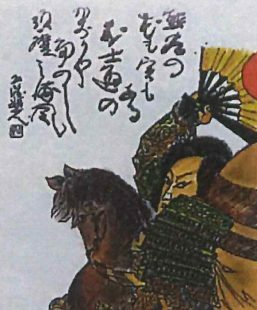 There are many legendary tales of Naozane/Rensei, including the story about his horse Gonta-Kurige called Junen-Shichiire and another tale about riding his horse backwards called Toko-Sakauma. Many temples exist today that are connected to Naozane. The stories of Naozane/Rensei is told in the literature and performing arts such as “Tale of Heike”, “Ichinotanifutabagunki & Kumagai-Jinya” from Kabuki theatre and in the Japanese traditional dance performed by a powerful feudal ruler Nobunaga Oda before he headed to the war of Okehazama was titled “Atsumori”. His life and its lasting influence have inspired affluent figures and many different people in the course of Japanese history. There are even plant varieties and cherry blossoms trees that bear the name Kumayaga. At the north entrance of Kumagaya Station of the Japan Railroad, people are greeted by a statue of Naozane created by the famous sculptor, Seibo Kitamura. Naozane still inspires the esteem and respect of the people of Kumagaya-city today. We remain open for business until December 31st during the holidays and closed until January 6th at the beginning of the new year. We may be closed on such occasions as over-the-counter promotional sales.